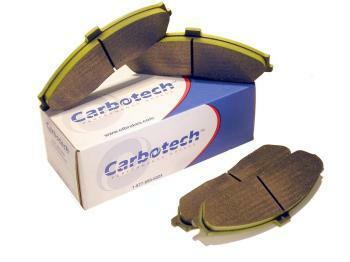 Carbotech XP10 Pads - Brakeswap.com - Friction for the Win! When Carbotech unleashed the XP10 to the general public, and it was an instant success, gathering multiple regional, divisional, and national championships. The XP10 is a very high initial bite friction material, with a coefficient of friction and rotor friendliness unmatched in the industry. Fade resistance is in excess of 1650°F. Due to the high level of friction and bite, this material is recommended for cars weighing around 2,000lbs or more, not including formula cars and cars with brake bias bars weighing less than 2,000lbs. This is the preferred compound for the front of Spec Miata racers, SSC,SSB, T3, SRF, ITS, ITE, H1,H2, H3, H4, 944 Cup, ST, GS, Factory Five Cobra’s and many more Grand-Am/ALMS/SCCA/NASA classes. XP10 is also ideal for advanced/instructor level HPDE drivers. XP10 still maintains the highly praised release and excellent modulation, rotor friendliness, and 100% non-corrosive dust that have made all Carbotech compounds so successful. XP10 is not recommended as a daily-driven street pad due to possible elevated levels of dust and noise.